I spend about half of my day working on the construction administration of our projects (in one form or another). 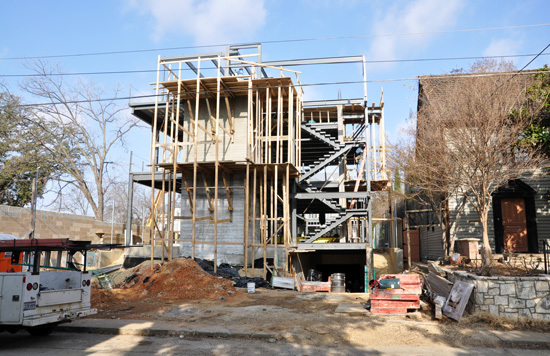 One of our current projects is a modern infill project under construction about 3 miles from our office. It’s a really interesting residence, full of site challenges, construction obstacles and clever details. There is a huge team of consultants on this project and trying to get everyone and their opinions and expertise on the same page takes a unique skill set. I have shown bits and pieces of this project before but I thought I would try and catch everyone up to where things are currently. If you can, take a look at the video below – it’s an animation I created in SketchUp almost 2 years ago. Many things have been tweaked since this model was created so this is not a perfect rendition of what the final product will look like – but it’s pretty close. This is what the site looked like before we got started. 52 feet wide and 225 feet long – sloping down from the street almost 12 feet. Basically the site is a bathtub and designing a way to let water cross our site and get it out of the this hole was a major design consideration. 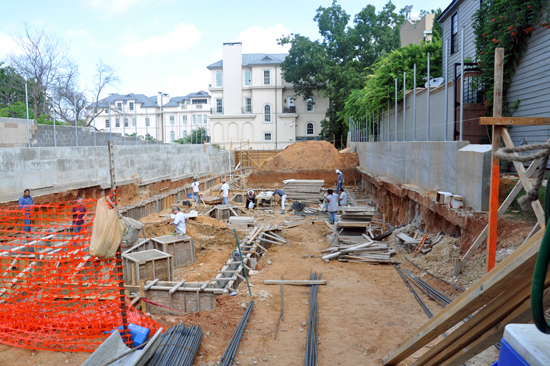 The project has a basement – something that is fairly rare for this area of the country. 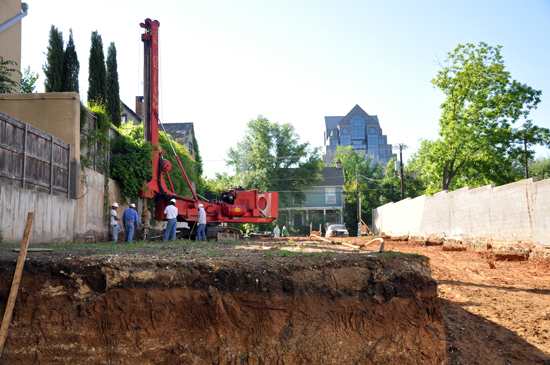 Rough grading has taken place and we are drilling piers to set our retaining wall on – this will keep our neighbors grade from tumbling in on our site. Another view of the site from the street – you can start to get an idea of the typography we are dealing with. 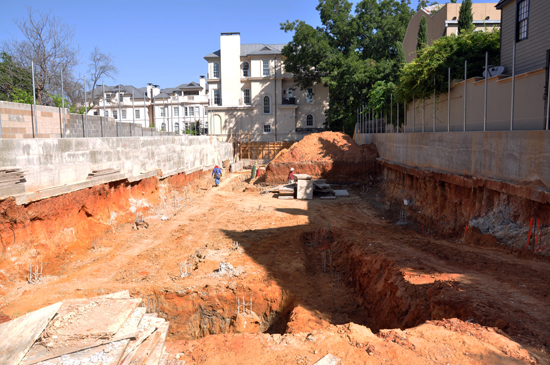 Since this is an infill project, we can’t change the grade at the property lines – that means a lot of piers holding up a lot of retaining wall. Basement foundation framing begins in earnest. If you look along either long side of the lot, you can see the piers that are in place. These are called “solider piers” because they are spaced so closely together that they appear like soldiers standing in a line. 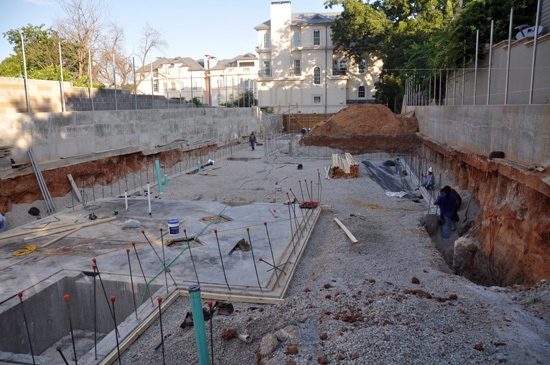 Here we can see some good progress, the basement foundation and slabs have been poured. If you look really, really closely, you can see the string lines the concrete contractor put in place to make sure everything was aligning and level across the site. Look about 15″ above the retaining wall we poured on the right hand side – you can barely make out a white string – these were actually all over the place. And the strings were there for this – the basement walls. 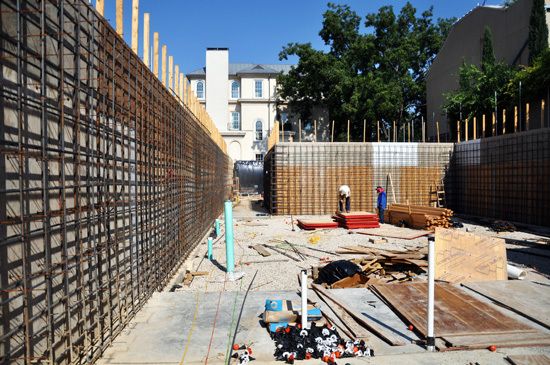 Our walls at this level were all poured in place concrete – a construction consideration we made given the surrounding grades and water table. I did write an earlier piece that focused on the concrete wall and a special wood grain texture we put on them. It also shows more photos of the elaborate process and form work – you can find it here. 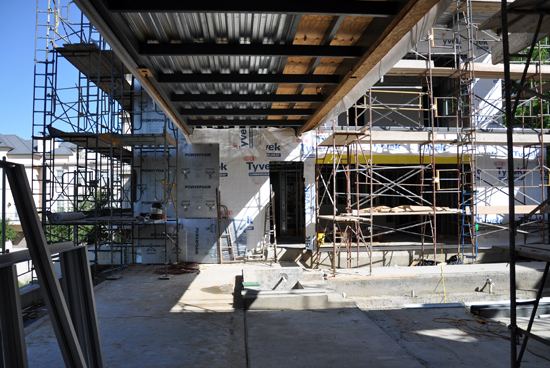 This building is essentially commercial construction – lot’s of steel and composite concrete decking. Luckily for us (or maybe the contractor) we were able to negotiate a deal with the owner of the adjacent empty lots so we could use his land as storage and lay down area. 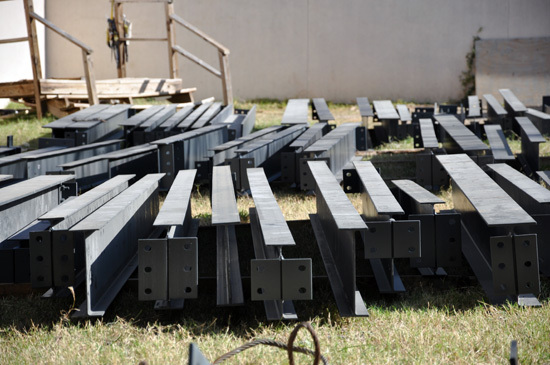 There certainly wasn’t any room on our site to store this much steel material … and this was just the first of many deliveries. 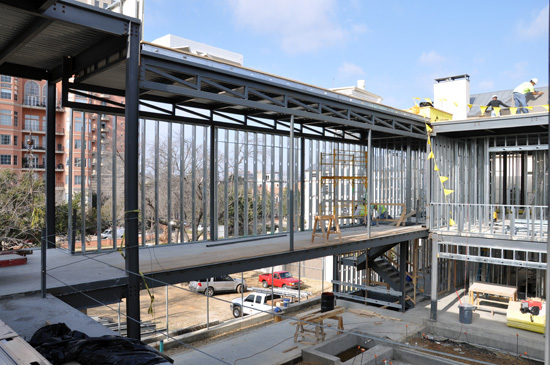 The steel frame and metal deck for the ground floor level is in place and it’s time to start backfilling the interior courtyard of the project. The contractor decided to put together this conveyor system so that they could just deposit fill into this hopper and it would move down the side yard and dump everything into the courtyard. He told me that he considered just getting enough manual labor to use wheelbarrows but ultimately decided this would be a more cost effective means of conveyance. I’m sure the backs of 20 people somewhere are silently thanking him for that decision. A look at the steel structure going up – not as fast as we would have liked but it went off without any major deviations from the drawings. Good coordination is a great insurance policy against future expenses. The two guys in the picture on the right are Keith the site superintendent and Steve, the contractor – both highly skilled and good guys. This picture is taken from the very far end of the site looking back towards the street. Since the grade drops off so severely for an interior urban lot, you are basically in a hole at this end. Roughly 85% of the basement level is underground but we installed these stairs (on both sides of the project) to bring you down to the natural grade. 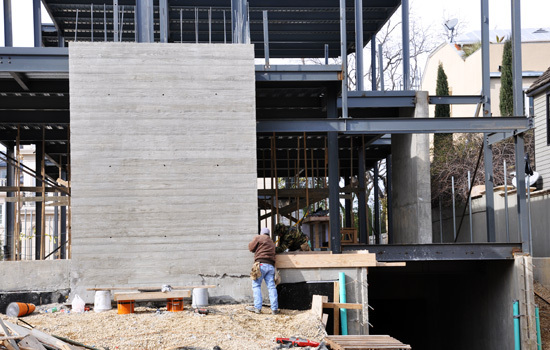 The concrete wall on the left has a special finish on it – we sandblasted 1x’s and installed them on the interior of the concrete form work. Concrete can be a cold material up close and this is one way that we tried to impact the scale of the material and the visual warmth and interest. 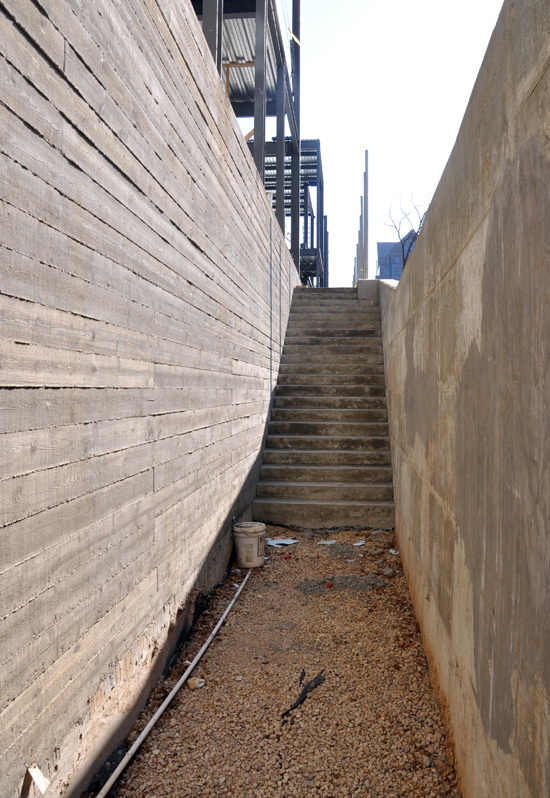 The concrete retaining wall on the right will receive a concrete slurry coating at the end of the project so it will be nice and smooth – a nice contrast I think. This is the front of the house taken from the street. On the right hand side, you can see where the ramp down into the basement will go. We have some of the vertically cast 1x board finished concrete on the front elevation as well. Another look at the front entry taken a few weeks later. The first level has cured enough for the second level pour to happen. 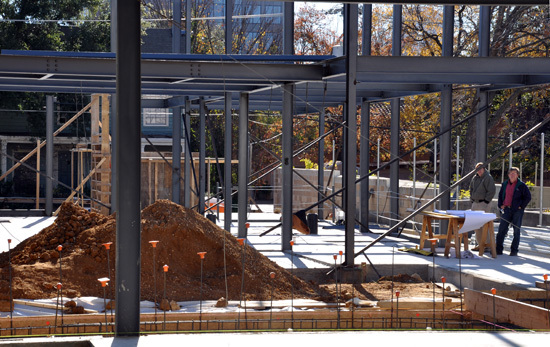 We have also received the steel for the main staircase at the entry (seen above the entrance ramp to the basement). One of the really nice features of this house is this bridge element. 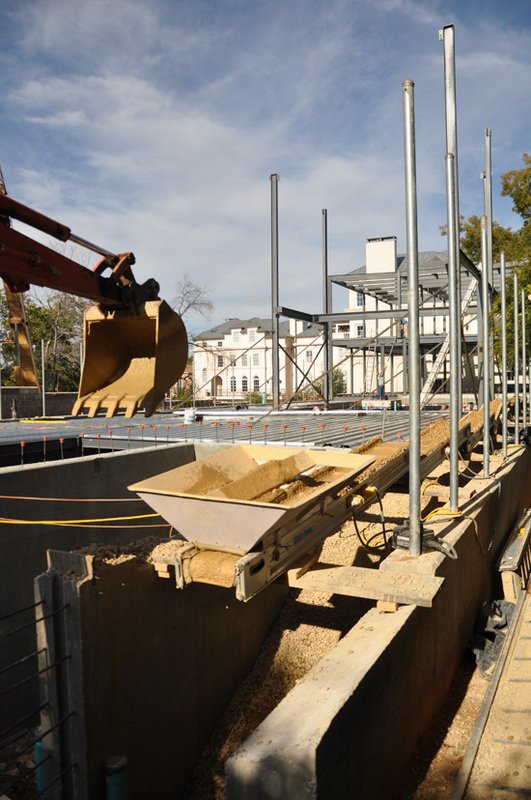 This is a connector piece that ties the two buildings together – there is a large hallway at the basement level, then the ground floor level will be open, and then this bridge feature on the upper level. The side of the bridge that is facing us in this picture will be floor to ceiling glass and will over look the pool down below. One of the reasons we assembled the massing for this project the way we did was to help control what the owner will look at in the future. As an infill project, there will ultimately be development on all sides, a mere 3 feet away from the property line. We broke the massing up so that everything could focus in to this interior courtyard – something that you see frequently in urban developments in Europe. It will also allow great quality Northern light into the spaces. 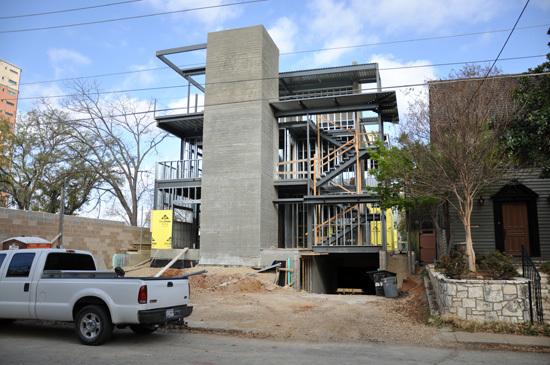 A last look at the entry way where you can now see that the vertically placed concrete has made it all the way up to the top of the project. The portion of the building that is on the uppermost left hand side is a roof observation level. From this spot, you have fantastic views of the downtown Dallas skyline. 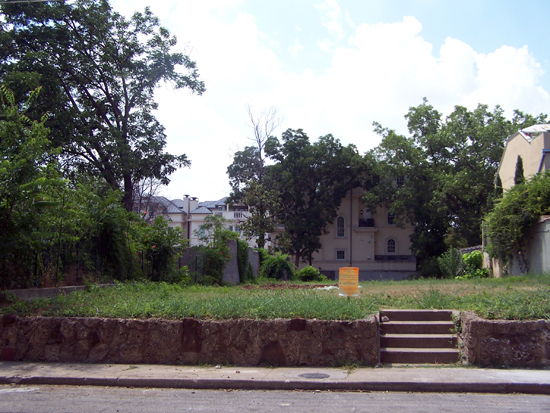 This is a side look at the property from an adjacent lot (that will one day be covered in 5 story tall townhouses). Once the steel and decking was in place, work on the roof commenced. The interior metal studs and exterior sheathing is moving along at light speed compared to the foundation and structural framing work. Except for me, OSHA would be proud of this photo, You can see that the workers who are installing the exterior sheathing are all wearing their safety harnesses. You can tell from this photo that I am using my architect warlock abilities and I am actually hovering in the air about 1 foot off the building. Just part of the extra service that comes standard in our office. This picture is the underside of the bridge that you saw earlier. Eventually a raised ipe wood deck will be installed here and the bridge will act as a covered terrace for the patio area. For those of you really, really observant – if you look up at the underside of the bridge floor you will see some plywood. 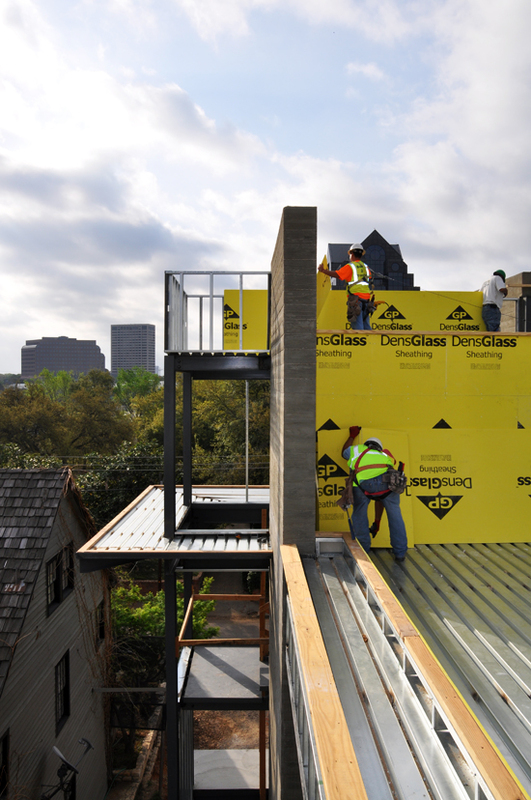 This will eventually be the location will a continuous glass floor will be installed. Luckily for my wife (and other people who don’t relish the idea of walking over elevated glass floors) the left hand side will not be glass and you will have the option of which type of floor you wish to walk across. 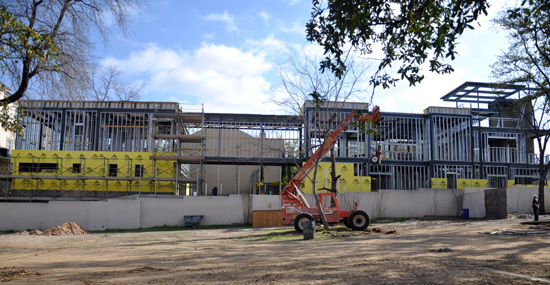 This is a view again of the long side elevation – the building has received it’s sheathing and building wrap, the windows are in place and finally the buildings massing is coming into shape. As this project develops, I will be able to focus in on materials and construction details, giving each the star treatment in a blog post. This time I just wanted to bring everybody through the last 9 months in rapid succession. Getting out of the ground isn’t very exciting for most people – the good part is still to come. 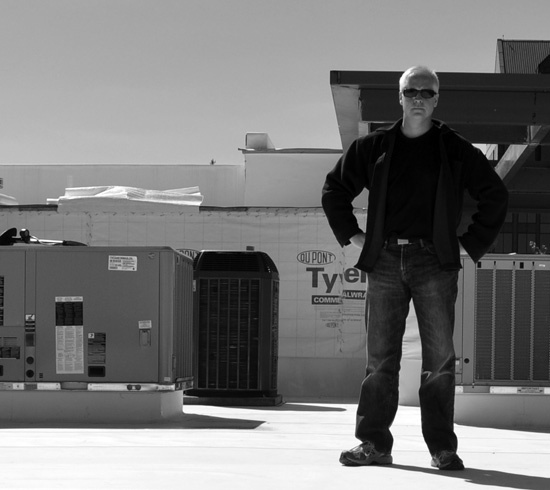 The last picture I have to share today is me on the roof of this project. I thought I would get a picture of me actually at the jobsite since I am always the person behind the camera lens … except you don’t ask a construction worker to take your picture unless you want to end up being forceably placed in the port-o-let. So this was the best I could do – set the camera down on the parapet wall, set the timer and run to the spot where I tried to focus. I am so not cool – but my terminator sunglasses let you know I am there for business.